Meet Herbie, a friendly hairy monster, in Herbie the Hairy Monster by Colleen Driscoll. Herbie plays in a dumpster and one day three boys are walking by, having fun and playing ball when they hear him crying. They are surprised to see him cry because they think monsters are strong and have no fears. Herbie says he thinks the name 'monster' is cruel and he does not like it when people laugh at him. He does not like it when kids pick on him and now he wants a disguise. The boys feel sad listening to all this and they decide to give him a makeover. Does Herbie like his new look? 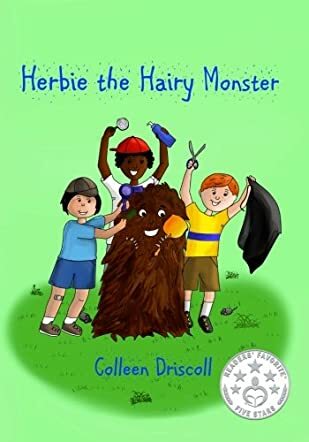 Herbie the Hairy Monster by Colleen Driscoll is a fun read and it is interesting to see the boys change Herbie’s look and make him appear like one of them, instead of looking like a monster. The illustrations are adorable and they give clarity to the author’s words and make the story, scenes, and the characters come alive. It is nice to see the three boys feeling sorry for Herbie and ending up making him feel happy. It is a good bedtime storybook and can be used for storytelling and read aloud sessions in classrooms and school libraries. Herbie the hairy monster is adorable and children will love the way the boys give him a makeover and put a smile on his face. The story is uplifting and will encourage young readers to do things for others to make them happy.